To gain CDC recognition, your organization must show that it can meet CDC standards and effectively deliver a proven diabetes prevention lifestyle change program. To receive Medicare Reimbursement, apply to become a Medicare Diabetes Prevention Program Supplier (see below). Use of a CDC-approved curriculum. You can use a curriculum developed by CDC, or you can develop your own or use that of another organization (with permission), as long as CDC approves it. Ability to begin offering the lifestyle program within 6 months of receiving approval from CDC. Capacity and commitment to deliver the program over at least 1 year, including at least 16 sessions during the first 6 months and at least 6 sessions during the last 6 months. Ability to submit data on participants’ progress—including attendance, weight loss, and physical activity—every 12 months. Trained lifestyle coaches who can help build participants’ skills and confidence to make lasting lifestyle changes. Designated individual(s) to serve as the diabetes prevention program coordinator. Participants must be 18 years of age or older and not pregnant at time of enrollment. All of a program’s participants must have a body mass index (BMI) of 25 or greater (23 or greater if Asian American). o Documented prediabetes based on a recent (within the past year) blood test (may be self-reported for CDC recognition purposes; but, for Medicare DPP suppliers, a self-reported blood test is not permitted). Lifestyle coaches who have been trained to deliver the required curriculum content and possess the skills, knowledge, and qualities may have credentials (e.g., RD, RN), but credentials are not required. 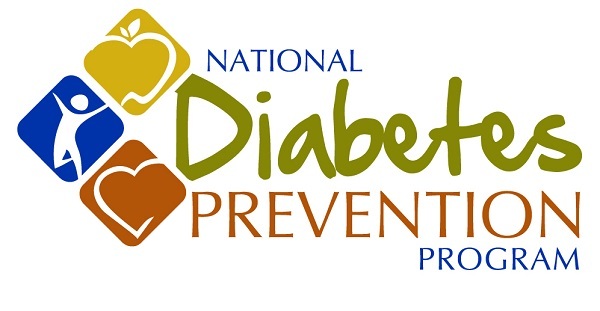 Diabetes Prevention Program Press Release – Customize this press release for your organization. We used language from the CDC Prevention Program website and gave it our own personalized spin. Customizable Diabetes Prevention Screening Tool in Word– Customize this tool for your organization. We copied the ADA PreDiabetes Screening tool onto this Word document to help engage participants to enroll in our Diabetes Prevention Program. Add your logo and contact information. This screening tool is approved by the CDC Prevention Program to help identify those at risk who are eligible to join your prevention program. Prevent Diabetes Stat Toolkit – This free and amazing resource from the American Medical Association includes a prediabetes risk test, sample referral form, a algorithm to identify and provide best care for people with prediabetes and more. Medicare Reimbursement Application 2018- to apply for reimbursement, recognized prevention sites need to complete this application. 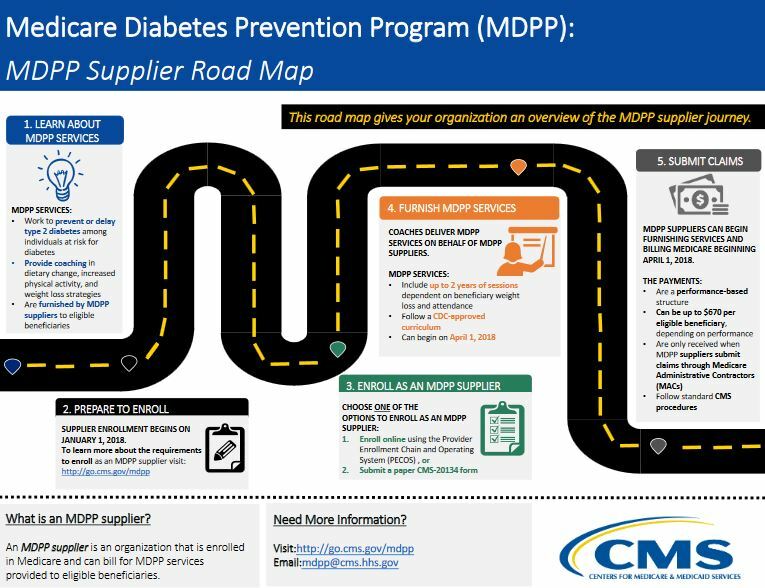 Medicare Diabetes Prevention Program (MDPP) Expanded Model Resource Page – a complete listing of the most recent documents outlining regulations to provide and receive reimbursement for MDPP. CDC National Diabetes Prevention Program Recognition Online Application – If you are ready to get your prevention program recognized, start here. CDC Resource Page to implement a LifeStyle Change Program – This page had all the information needed to get started. Includes requirements, curricula and handouts, staffing and training info, keys to success and more! Diabetes Prevention Program Info-graphics – This link provides print ready and web ready info-graphics on a variety of diabetes related topics. Great resource for getting the word out and marketing campaigns. What are the complications of prediabetes? Prevention is cost effective. It only costs about $300 per person in resources (i.e., instructors, overhead, handouts) to provide the DPP Program through the YMCA. Trained lifestyle coaches can successfully provide the program in a variety of settings. Making and sustaining lifestyle changes with diabetes is a challenge. Many people know what to do to improve their health; it’s figuring out how to do it that is the biggest challenge. Diabetes Healthsense is an online library of resources compiled by the National Diabetes Education Program. These excellent resources are also from the National Diabetes Education Program Health Finder.